Torain Organizer brief case is no longer available. We have reduced our price for the Professional Kit. 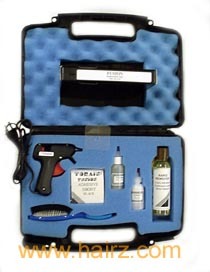 Torain Professional Organizer kit comes in a brief organizer case. It includes- a glue gun, an instructional video tape (40 min. ), 2 packs of glue sticks (total of 12 glue sticks), a wooden pusher, a desolver, a friction powder, a hair placement disk and an instruction booklet, 8 once Rapid Remover. More information on Fusion with photos, right here.